Seagrass is a nursery ground for fish. Some 95% of the ocean is completely unexplored, unseen by human eyes. That naturally means that there are many marine environments that we don’t know much about, but that we’re still putting at risk from damaging activities such as bottom trawling. Meadows of seagrass – flowering plants that live in shallow, sheltered areas – are a prime example of such a habitat. Knowing the location and value of environments such as seagrass meadows, which are a nursery for fish, is key if we are to tackle our biodiversity crisis. With 70% of the Earth covered by ocean, exploring it all presents an enormous challenge. Thankfully, seagrass meadows are restricted to the shallow waters (less than 90 metres deep), but finding them still isn’t easy. From charismatic and endangered species like seahorse, turtle and dugong to important food fishes like cod and herring, seagrass meadows support rich biodiversity. Importantly, 22% of the world’s most landed fish species (including the Atlantic cod) use seagrass as a home at some stage in their life. Seagrass meadows also provide one of the most effective stores of carbon on our planet. Sustaining this store may be an important part of mitigating the worst impacts of climate change. Marine vegetated habitats, which include seagrasses, salt-marshes, macroalgae and mangroves, occupy only 0.2% of the ocean surface, but contribute 50% of carbon that is stored in ocean sediments. Knowing where this carbon is stored will help us to keep it in the ground. The use of satellites is often considered to be a panacea for understanding habitat distribution. This is not the case for shallow water seagrass meadows though. If you can’t see the seagrass (due to turbid water) with a snorkel and mask, then how do you expect a satellite to see it? 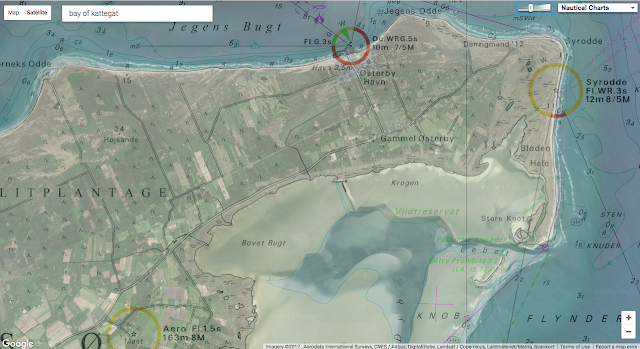 Solutions for locating and mapping seagrass are needed that go beyond space observation. Seagrass meadows are present around the coasts of all continents except the Antarctic. Although seagrass meadows are of fundamental value to people, data on their distribution and health around the world is limited. To date, around 600,000km² of seagrass has been mapped globally, but it is estimated there could be some four million km² of it. If we are to protect this key marine habitat, we need to know exactly where it is as there are a myriad of threats to these powerhouses of the sea, including poor water quality and climate-related impacts followed by extreme weather events. The scale and cost of responding to this challenge appears to be beyond the capacity of most governments. This is a logistical, as well as a financial issue. Even in developed countries such as the UK there is not a reliable estimate of seagrass extent, which could be over 600km². To plug this significant global information gap a new approach is needed. This approach should enable partnerships and encourage data sharing between governments, private enterprises, conservation groups and the general public. To achieve this we need user-friendly tools and resources that can draw on a global community of citizen scientists to help understand these amazing habitats. Citizen science has contributed to major scientific breakthroughs, most notably in space. They represent a potential research team that could be drawn upon to help solve some of the challenges facing seagrass meadows today. Citizen science enables us to crowdsource data and engage people in conversations about why we need to protect biodiversity and other resources provided by nature. As seagrass prefers sheltered and shallow coastal bays, it is an ideal candidate for citizen science programmes. It is easily accessible, and its functional characteristics mean that answering broader questions about its health, reproductive status or even associated fauna can be met using targeted citizen science campaigns. Our new research, published in the journal Marine Pollution Bulletin, illustrates how citizen science platforms can be a key means of collecting much needed information to secure a future for seagrass. Such platforms can also inspire a new generation of seagrass scientists wishing to conserve them – and help meet the challenge of making seagrass a familiar species. Pictures taken of intertidal seagrass can be a valuable way of citizen scientists helping to map seagrass. One platform, SeagrassSpotter (created by scientists at Swansea University, Cardiff University and the marine conservation charity Project Seagrass), was developed to engage and support budding seagrass citizen scientists. In a Pokémon-Go style, SeagrassSpotter aims to engage citizens from around the world to find and document seagrass meadows. They may do this when walking at low tide, snorkelling or when diving underwater. In effect, the programme provides a means for untrained scientists to collect reliable and geo-referenced data on seagrass presence and condition – data that is typically costly and logistically difficult to collect on a regular basis. SeagrassSpotter was officially launched in 2015. To date, over 750 observations have been recorded by 360 users from 94 locations throughout the North Atlantic, Mediterranean and Caribbean regions. This includes one sighting of a seagrass meadow in Wales that was last recorded in 1891. Over the coming months, SeagrassSpotter will be expanded to include more regions of the world. We believe that while governments should have a statutory responsibility to monitor, map and understand our important seagrass resources, it’s unrealistic to expect this to be complete. If recent viewing figures for the documentary series Blue Planet II are anything to go by, members of the public are becoming more interested in the marine environment. Securing a future for seagrass could well lie in the hands of local people (literally) acting as citizen scientists. The first ever all-electric cargo ship is in operation in China's Pearl River. While it's a step in the right direction to eliminate fossil fuels, the ship is being used to carry coal — the very material that encouraged the shift to clean energy. China is now the proud owner of the world’s first all-electric cargo ship and has already put the vehicle to use. Constructed by Guangzhou Shipyard International Company Ltd, it can travel 80 kilometers (approximately 50 miles) after being charged for 2 hours. As noted by Clean Technica, 2 hours is roughly the amount of time it would take to unload the ship’s cargo while docked. Other stats for China’s cargo ship include being 70.5 meters (230 feet) in length, a battery capacity of 2,400 kWh, and a travel speed of 12.8 kilometers per hour (8 mph). It’s definitely not the fastest electric vehicle we’ve seen hit the water, but it’s designed for transporting numerous objects rather than speed. “As the ship is fully electric powered, it poses no threats to the environment,” said Huang Jialin, general manager of Hangzhou Modern Ship Design & Research Co, the company behind the ship’s design. While the ship is yet another sign of the changes coming to our relationship with fossil fuels, its cargo shows we’re still a ways off from a complete shift. 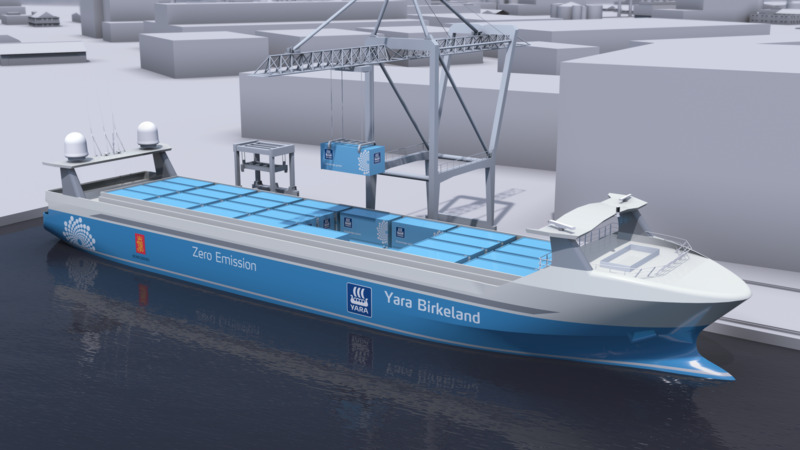 Ironically, the world’s first all-electric cargo ship is being used to move coal, according to Chen Ji, general manger of Guangzhou Shipyard International. Yes, despite generating zero emissions on its own, the cargo ship is still, in a way, contributing to the generation and spread of gas emissions that led to global warming. It’s still an objectively better scenario that a traditional cargo ship carrying coal, but one can easily see how using clean energy to make coal cheaper misses the entire point of clean energy. Hopefully the electric cargo ship won’t be carrying coal for long, and China can find it better haulage. Perhaps parts for wind turbine construction. Or even additional lithium-ion batteries. Whatever the short-term future holds, we’re seeing more of the means we need to improve in the long-term. 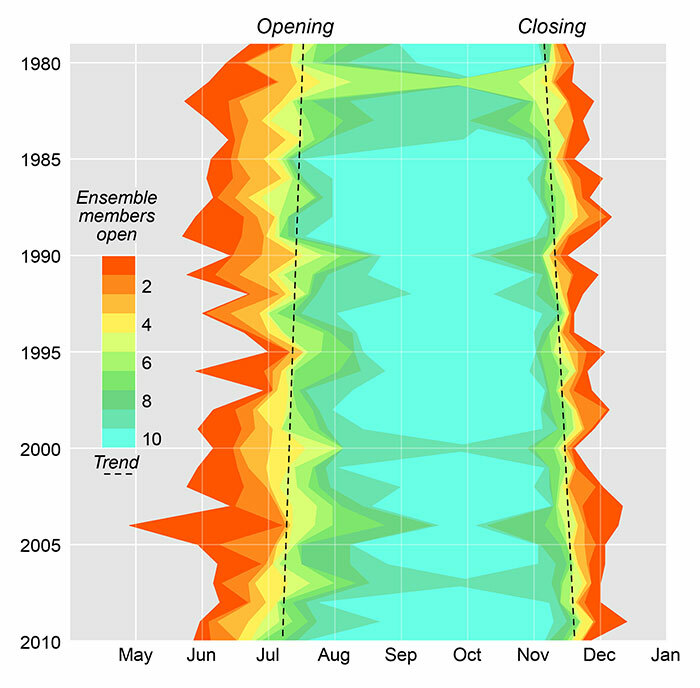 This video shows ocean temperature changes around New Zealand throughout one year. The water temperature in the Tasman Sea is well above normal - a whopping 6 degC more than average for the start of December. The increase has been driven by a La Nina climate system, and scientists say a continued warming of our ocean could permanently damage our fisheries and lead to tropical cyclones. Seven and thirty day NZ sea temperature anomalies November 2017. NIWA meteorologist Ben Noll says the "very impressive marine heatwave" has led to the largest deviation from normal temperatures in the world. 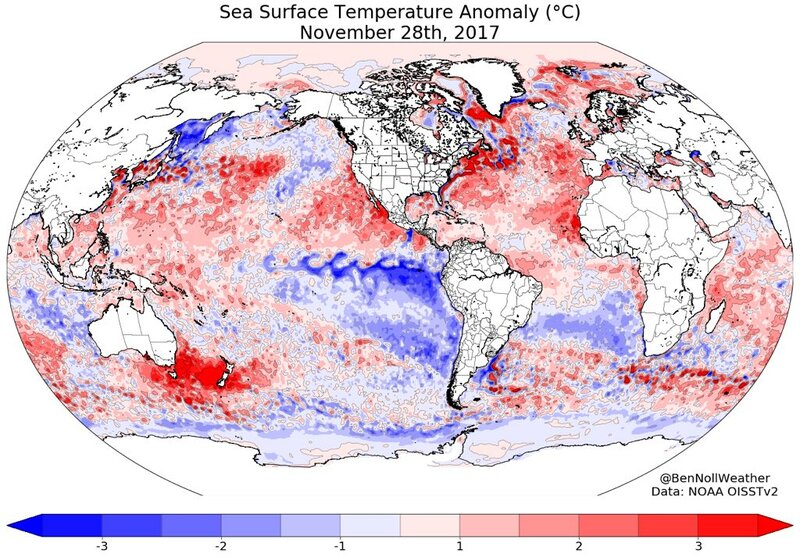 "The sea surface temperatures in the Australia-New Zealand region are presently the most anomalous on the globe," he says. "Typical La Nina signature but intensity turned up many notches." A very impressive marine heatwave is unfolding near the east coast of Australia, across the Tasman Sea, and in New Zealand coastal waters ... average anomaly is +1.98°C and max anomaly is a gaudy +6.16°C off NZ's West Coast. 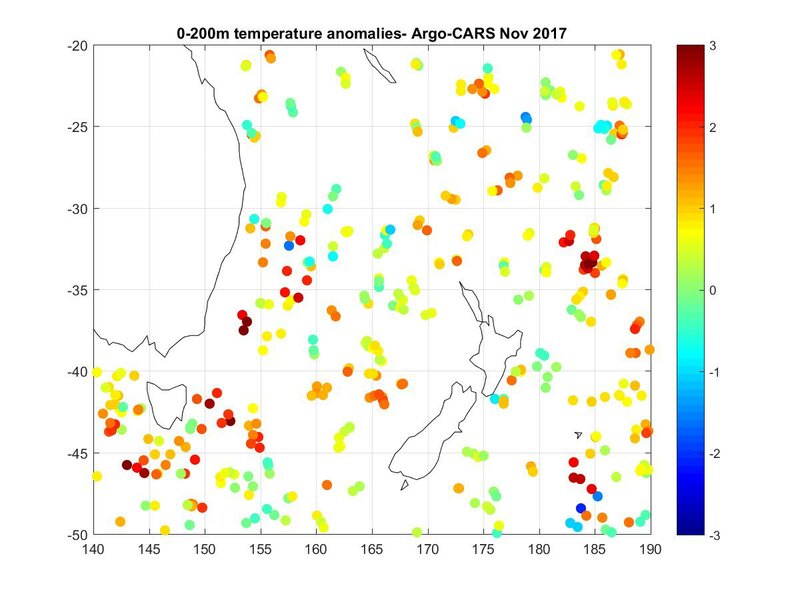 Global water temperature maps show the Tasman Sea between New Zealand and Australia stands out, both with the largest increase and largest area affected. The warmth is more than just skin-deep. Temperature anomalies of 1degC to 3degC are being found in the top 200 metres. 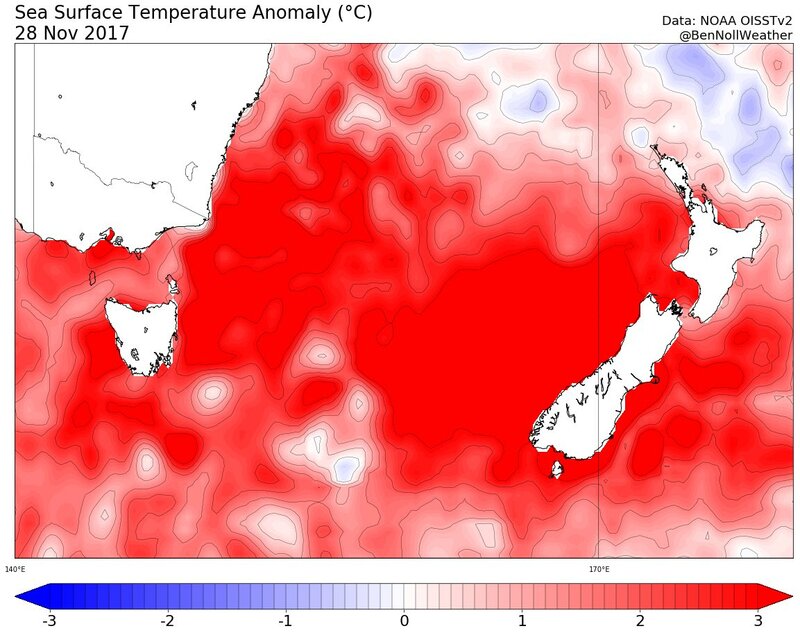 The sea surface temperatures in the Australia-New Zealand region are presently the most anomalous on the globe ... typical La Nina signature but intensity turned up many notches. NIWA climate scientist Nava Fedaeff says this is due to the lack of storms, which churn up the ocean and reduce temperatures. However she warns that calm conditions now could increase the strength of tropical storms and cyclones when they do hit. "Warm seas can act like fuel," she says. "If we do get a tropical storm this could add more moisture to the system." anomalies of 1 to 3 degrees found in the top 200 m (650 ft) of the sea. NIWA marine biogeochemist Professor Cliff Law says this ocean warming is likely to continue, and could lead to more invasive species and possibly new diseases in our fisheries. "The average warming around New Zealand is 2.5degC by the end of this century, which will affect how the ocean mixes and the nutrients available for plankton growth, with knock-on effects on the foodweb and fisheries," he says. "All regions will see a reduction in food supply, because of a decrease in particulate material sinking from the surface - and that is what links climate change to our fisheries." The leatherback turtle is the largest turtle on the planet. David Attenborough travels to Trinidad to meet a community trying to save these giants. The world’s oceans are under the greatest threat in history, according to Sir David Attenborough. The seas are a vital part of the global ecosystem, leaving the future of all life on Earth dependent on humanity’s actions, he says. Attenborough will issue the warning in the final episode of the Blue Planet 2 series, which details the damage being wreaked in seas around the globe by climate change, plastic pollution, overfishing and even noise. Previous BBC nature series presented by Attenborough have sometimes been criticised for treading too lightly around humanity’s damage to the planet. But the final episode of the latest series is entirely dedicated to the issue. “For years we thought the oceans were so vast and the inhabitants so infinitely numerous that nothing we could do could have an effect upon them. But now we know that was wrong,” says Attenborough. “It is now clear our actions are having a significant impact on the world’s oceans. [They] are under threat now as never before in human history. Attenborough says: “Surely we have a responsibility to care for our blue planet. BBC executives were reportedly concerned about the series appearing to become politicised and ordered a fact-check, which it passed. The series producer, Mark Brownlow, said it was impossible to overlook the harm being caused in the oceans: “We just couldn’t ignore it – it wouldn’t be a truthful portrayal of the world’s oceans. We are not out there to campaign. Brownlow said much of the footage shot of albatross chicks being killed by the plastic they mistake for food were too upsetting to broadcast. The programme also filmed on the Great Barrier Reef in 2016, witnessing the worst bleaching event in its history. A bleached section of the Great Barrier Reef in Australia. Climate change is causing ocean temperatures to rise, bleaching the corals vital as nurseries for ocean life, and waters are warming rapidly in Antarctica too. Jon Copley, from the University of Southampton and one of many scientists appearing in the final episode, says. “What shocks me about what all the data shows is how fast things are changing here [in Antarctica]. Carbon dioxide from fossil fuel burning also dissolves in seawater, making it more acidic. Prof Chris Langdon, at the University of Miami, says it is “beyond question” that the problem is manmade. The noise from shipping, tourism, and fossil fuel exploration is also revealed as harming sea life. Steve Simpson, at the University of Exeter, who works on coral reefs in southeast Asia, says: “There is a whole language underwater that we are only just getting a handle on. They use sound to attract a mate, to scare away a predator. He shows the noise of motorboats distracting saddleback clownfishes from warning against a predator attack. The Blue Planet 2 team found plastic everywhere they filmed, even in the most remote locations such as South Georgia island, an important breeding site for wandering albatrosses. There, Lucy Quinn from the British Antarctic Survey says many chicks are killed by plastic fed to them by their parents, including one young bird whose stomach was punctured by a plastic toothpick. Overfishing, which remains prevalent around the world, is also addressed. “Every night thousands of miles of fishing lines laden with hooks are set – there is enough, it is said, to wrap twice around the world,” says Attenborough. But the programme also highlights some success stories, such as the revival of sperm whales off Sri Lanka and herring stocks off Norway after bans or restrictions were put in place. 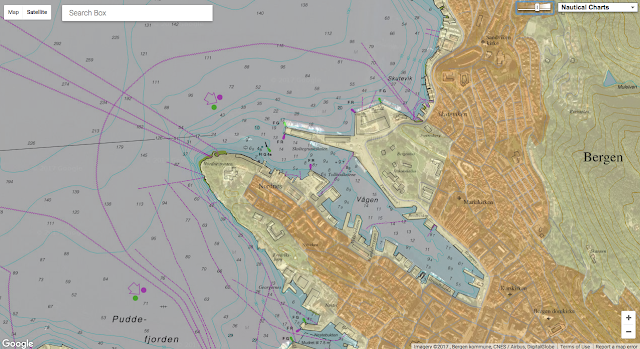 Strict management of the herring fishery in Norway has saved it from collapse. Herring now draw in humpback whales and orca. Attenborough also visits Trinidad, where the conservationist Len Peters has transformed the prospects of the giant leatherback turtles who come to the island to lay their eggs and whose numbers have fallen catastrophically in recent decades. “I grew up in a house where turtle meat was normal,” says Peters. But his work to end turtle hunting and encourage tourism has seen numbers rise from 30-40 to more than 500. Quinn says the oceans are of vital importance for the whole world: “The oceans provide us with oxygen, they regulate temperature, they provide us with food and energy supplies. Daniel Pauly, who leads the Sea Around Us programme at the University of British Columbia in Canada, and was not involved in Blue Planet 2, endorsed its stark conclusion. He said vast, subsidised fishing fleets were scraping the bottom of the barrel and that ocean acidification could be terminal for many species. CBS news : UN environment chief warns "we're facing an ocean Armageddon"
A recent forecast of future trade suggests that by mid-21st century container ships could carry double the capacity of the largest present day ships. By then, a new potentially competitive sailing route could develop. An artist render Samsung Heavy Industries’ 21,100 TEU container ship. A decade ago, the bulk of the world’s sea-going container trade was carried aboard Panamax-size container ships of 5,000 TEU capacity. The combination of increased international trade and developments in transportation logistics required the development of larger container ships to sail between Europe and Asia, also between Asia and West Coast America. There was also a perceived need to upgrade the Panama Canal to transit much larger container ships and also increase the transit capacity of the Suez Canal by building a section of parallel navigation channel, with future plans to extend that parallel section. At present, the Suez Canal allows passage to vessel of under 1,006 square meters submerged cross section, restricting passage to container ships of under 16.75 meters draft by 60 meters beam. Within the next decade, container ships built to 18 meters draft by 65 meters beam by 420 meters length and carrying over 28,000 TEUs could appear on the trans-Pacific service between west coast American ports and Asian ports, also between Asian ports and selected Brazilian ports such as Fortaleza (Pecem) sailing via the southern tip of Africa. Changing weather patterns could provide a route for such ships between Asia and Europe. Geologists and climatologists have discovered much about the earth’s weather history, dating back over several thousand years. The Arctic region has undergone multiple repeat cycles occurring every 10,000-years of warm periods where the region was free from ice. While climate change may contribute to a warming Arctic, the region has been free from ice during several previous periods. There is also a long-term cyclical history of El Nino and La Nina weather patterns and the earth has undergone several cycles of warming and cooling.Changing weather patterns are part of the earth’s long-term climatic history. 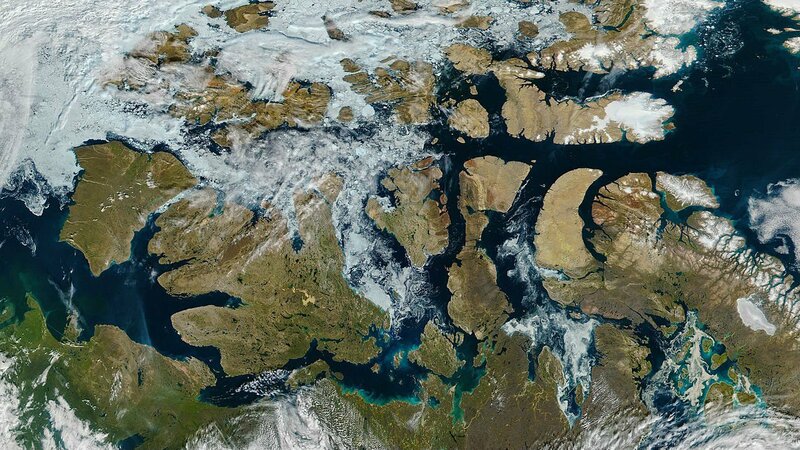 While the sailing draft along Russian side of the Arctic sailing route is suitable for Seaway-max size of ships, most of the Canadian passage through McClure Strait and Barrow Strait between the Beaufort Sea and Baffin Bay exceeds a depth of 200 meters. Within the next decade, container ships of 28,000 TEUs could appear, as changing weather patterns and a warming Arctic could allow the Canadian passage to transit container ships for perhaps a period of three months per year. Perhaps within a quarter of a century, Canada’s northwest sailing season could extend from early May to late October. Container ships that sail via the Canadian Arctic would likely sail from Asian ports such as Shanghai, Busan, Qingdao, Fuzhou and Hong Kong to east coast American ports such as Newark, Sydney NS and Melford Terminal NS as well as to European ports such as Rotterdam – Antwerp. The future competitiveness of the Canadian passage will depend on the pace at which average temperature increases at the Arctic. Future enlarging the Suez Canal to transit larger container ships would depend on traffic sailing west from Asian ports such as Singapore, Vizhinjam (India) and Colombo to Europe and North America. Beyond the next decade, container ships of more than double the capacity of neo-Panamax container ships could enter service and potentially sail via the Arctic for a few months per year. Such a development could divert traffic sailing between Asia and east Coast North America, away from the Panama Canal and to ship-to-ship container transshipment terminals currently being developed in Eastern Canada, from where a multitude of smaller vessels would sail to mainly American east coast ports and ports located along the St Lawrence Seaway. Shippers could seek to maximize container movement during the northern navigation season. While the northern passage is open to shipping, super ships from western Asia ports will still sail via the Suez Canal to European and east coast North American ports. The future seasonal closure of the northern passage would result in a seasonal increase in mega-ship traffic sailing via the Suez Canal and involve ships sailing from eastern Asia ports to European ports, Port of Newark and east coast North American transshipment terminals. The combination of the development of larger future container ships and trans-Arctic navigation via Northern Canada represents future competition for the Panama Canal. While reconstruction was underway for the Panama Canal to transit larger ships, corresponding reconstruction began at many ports internationally to berth and provide service to larger ships. At the present time, a small number of international ports and planned ports that are under construction offer sufficient depth to clear the draft of the next generation of mega-size container ships.Most ports that serve the present generation of mega-size ships will require further dredging with possible modification to port entrances to deflect prevailing ocean currents so as to minimize build-up of silt following port deepening. There may be scope to modify a few deep-sea ports that presently serve only bulk cargo carriers to function as stop-over ports-of-call for future mega-ships. Such ports would include Richard’s Bay and Saldanha Bay in South Africa, both located on the Asia – Brazil mega-ship route. By mid-century if projected trends in international trade continue, container ships of up to 35,000 TEUs could enter service and approach 19 meters draft, 39 meters height, 69 meters beam and 450 meters length. Some ports would require that bridges be raised in the future for such ships to arrive at quayside. Long-term market projections suggest that by mid-century, international trade could require container ships of up to 50,000 TEUs capacity. Concept ships of up to 35,000 TEUs could fit into the envelope (draft, beam and length) of the largest oil tankers. Super-size ships would likely appear on the Asia – Brazil service and the trans-Pacific service between east Asia and west coast America. Depending on the pace of Arctic warming and a future northern navigation season, future mega-size container ships could sail via the Canadian Arctic route on voyages between east Asia and Europe, also between east Asia and east coast North America. Future mega-ships sailing to the North American east coast and Europe from Asian ports such as Vizhinjam, Colombo and Singapore would provide future business for the future twin channels of the Suez Canal, perhaps with a wetted cross section increased from 1,006 square meters to 1,200 square meters and perhaps even greater. Future mega-size container ships could likely sail exclusively between transshipment terminals. Maritime Executive : An Articulating Hinge for a 50,000-TEU Container Ship / 50,000 TEU... the Future or Not? Hellenic Shipping News : Huge Implications of Russia’s Northern Sea Route. An Alternative to the Suez Canal? Our ocean currents are part of the most powerful machine on Earth. providing a 5 knot ocean current with more kinetic energy than a 350 km/h wind. The Sea Level Thematic Center (SL TAC), part of the Copernicus Marine Service is in charge of providing satellite sea surface height and wave observation data. Our vision of ocean currents is slightly more complex now than in 1869 when Jules Verne published his novel, but some of the above statement still remain true (it was mostly coming from the oceanographer Matthew Maury, who wrote « The Physical Oceanography of the Sea », published 1855). The complexity lies in the turbulence: the ocean currents are not “straight” rivers crossing the seas as might be interpreted from the citation above, but turbulent flows shedding eddies all along their paths. Their observation now is done not only at sea, but also from above: satellites enable to measure the reliefs of the sea surface. These in turn can be used to compute the currents which are turning around the “hills” and “valleys” of this surface. The steeper the slope of the relief, the faster the currents, so that we can map ocean currents any day of the last 25 years over the whole world from observations. 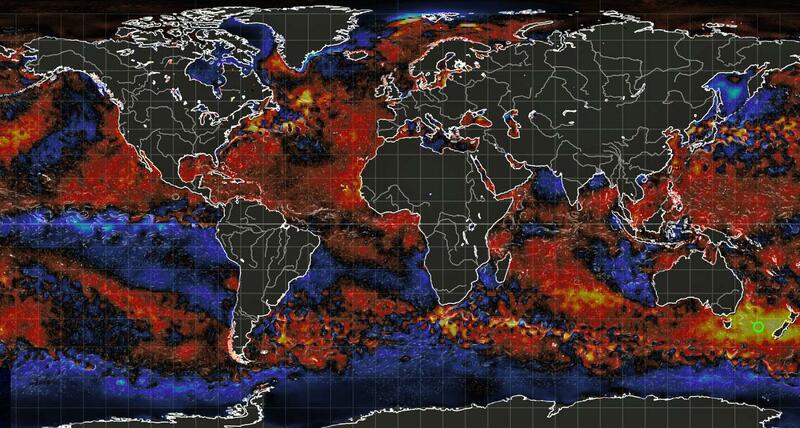 Over those 25 years, no less than 12 satellites has been used, with currently 6 of them measuring, enabling to make the most detailed daily maps of ocean surface ever.